About : The quick and easy way to heat water to a perfect temperature, for all teas from herbal to green and everything in-between. It Really Tastes Like Bubble Gum! Summary : This truly is the "ultimate tea" for kids, or anyone else for that matter who can't get enough of bubble gum. To put it bluntly, if you like bubble gum, or your kids do, get this tea. You won't be disappointed. Review : Well, it's 4am and sleep eludes me, so I put in the laundry for something to do. While waiting for the laundry, I suddenly had a urge for bubblegum. Why? No earthly idea. And then I remembered, oh my, didn't I have a bubble gum flavored rooibos tea somewhere? So I began a desperate look through my tea samplers, and sure enough, there it was. 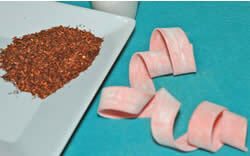 A rooibos tea flavored with bubblegum put out by Little Snowbird Teas. The Bubblegum Blast Rooibos Tea from Little Snowbird Teas contains the following ingredients : Fair Trade Certified rooibos, natural and artificial flavors: bubblegum. Here is how Little Snowbird Teas describes this tea on their website : "This is a delightful treat for those bubblegum enthusiasts out there, you know who you are!" I'll confess here. I was VERY dubious that ANY tea could be flavored to truly taste like bubblegum. Indeed, I was suspicious that even the aroma of the tea would have a bubblegum fragrance. Just goes to show you what I know. I opened up the sampler bag and wow, what can I say, bubblegum! If I was blindfolded and smelled this tea for the first time (and thus didn't know the fragrance came from a tea), I really would have through that this was a big piece of bubble gum. In other words, the fragrance of this tea mimics bubblegum almost perfectly. As I do enjoy bubblegum, I became very intrigued by this tea. So I boiled water and poured it over the leaves and, sure enough, the fragrance of bubblegum remained. And so, with happy thoughts in my mind just then, I inpatiently began the seven minute brew time I used for this tea. I was not disappointed. This tea REALLY does have the flavor of bubblegum. Truthfully, I was amazed by this, as I was sort of expecting the standard rooibos flavor to come poking through, over-riding the flavor of bubblegum. But nope. The flavor of rooibos is all but missing. For all intents and purposes, this tea tastes like a liquid version of bubble gum you pick up at the store. And just as happily, the fragrance of bubblegum also remains once the tea is brewed. If I had any disappointment at all with this tea, it was with it's after taste. Yes, the after-taste was indeed bubblegum. But, it didn't last too long. About five minutes after the tea was gone, so was the pleasant flavor of bubblegum too. But oh well, can't have everything in life I guess. Recommendation : Absolutely. If you or your kids enjoy bubblegum, you can't help but to really enjoy this tea. This tea also makes the SUPERB way to introduce kids to tea. I mean, what kid doesn't like bubblegum? The tea sample used for this review was provided by Little Snowbird Teas. Brewing Instructions : Use +1 teaspoon of tea leaves. Pour 6 ounces boiling water over leaves. Let brew at least 5 minutes (7 used for this review). Little Snowbird Teas Vanilla Mint Rooibos Tea : An enjoyable and rather sweet tea that isn't bitter and which nicely blends mint and vanilla. Adagio Teas Cinnamon Apple Rooibos Tea : A very tasty tea that tastes remarkably similar to hot apple cider. Numi Ruby Chai Spiced Organic Rooibos Tea : This is an excellent rooibos tea. If you enjoy spicy teas, you'll most definitely enjoy this tasty tea. Culinary Teas Summer Punch Green Rooibos Tea : A light and refreshing green rooibos tea with a distinct orange flavor to it. All work on this site is the legal property of TeaDiscussion.Com and may not be duplicated in any way without express permission.